This is the dreaded marital duty discussions with a very horrified Charlotte. I could hardly breath by the time this conversation was over because there were PROPS! Here's where the fun begins. "You see, a man's...ahem...is shaped differently from a women's..." Mama fluttered her hand "...whatsit. And in the marital bed, he will wish to place his ..." More hand fluttering. "...inside yours." Hehe...then there is a peach and an aubergine (long eggplant) to help explain. I really couldn't breath for laughing so hard. LOVE this book! Wylan watched as Kaz set the room to rights. He moved an envelope a little more to the left, pulled a drawer on the largest file cabinet out a bit farhter, pushed the chair back just so. When he was done he scanned the room, then plucked the pen from Wylan's hands and set it carefully in its place on the desk. "A proper thief is like a proper poison, merchling. He leaves no trace." Kaz blew the lamp out. This is a super basic teaser, but I did this on purpose for two reasons: I'm only on chapter two, so I have less than two chapters of this book to choose a teaser from at the moment, and I know I am avoiding spoilers like the plague so no way in the world would I post anything spoilery-like. SO YEAH. I'm so excited to be reading this book! I adored Six of Crows and I'm all kinds of flail-happy to continue on with this story! Haha! That first teaser! Oh that's funny!! 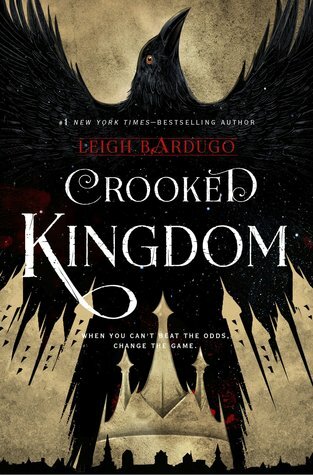 And nice teaser from Crooked Kingdom!! Finally reading Six of Crows myself. Being "bad" and ignoring a few review books to binge the duology! LOL! Great teasers! Oh I love me some Tessa Dare. That sounds hysterical. I also seriously need to read Six of Crows soon!